Blue Knob State Park offers year-round wilderness adventures on 6,128 acres of woodland. The park is in the northwestern tip of Bedford County, west of I-99. Altoona, Johnstown, and Bedford are within 25 miles of this scenic park. The elevation of the park can cause air temperatures to be several degrees cooler than the surrounding cities. The annual snowfall averages about 12 feet. One of the unique features of the park is the solitude it provides the visitor. There are many opportunities to enjoy the quiet and refreshing serenity of the mountains and streams. The park is open every day of the year, sunrise to sunset. Day use areas close at dusk. The park office is open specific hours. The pool, overnight areas, and other areas are open specific seasons and hours. Contact the park office for facility seasons and hours. Make online reservations or call toll-free 888-PA-PARKS (888-727-2757), from 7:00 A.M. to 5:00 P.M., Monday to Saturday. From East or West: Take the Pennsylvania Turnpike to Bedford, Exit 146. Go north on I-99 to Exit 7. Follow PA 869 west to Pavia, then follow signs through Pavia to the park. From North: Take I-99 south to Exit 23. Follow Old US 220 south. Turn right onto PA 164 west, follow to the town of Blue Knob. Turn left onto Blue Knob Road (LR 4035) follow five miles to northern entrance of the park. From South: Take I-70 west to Breezewood, then US 30 west to Bedford, then north on I-99 to Exit 7. Follow PA 869 west to Pavia, then follow signs through Pavia to the park. Driving Directions: The Interactive GIS Map has turn-by-turn driving directions to the park office from the Park Information Window. Blue Knob State Park is named for its majestic dome-shaped mountain. At 3,146 feet above sea level, Blue Knob is the second highest mountain in Pennsylvania, only 67 feet shorter than Mount Davis in Somerset County. Situated on a spur of the Allegheny Front and overlooking the scenic Ridge and Valley Province to the east, Blue Knob has spectacular views. Unique photographic opportunities are available during low humidity weather and with changes of season. 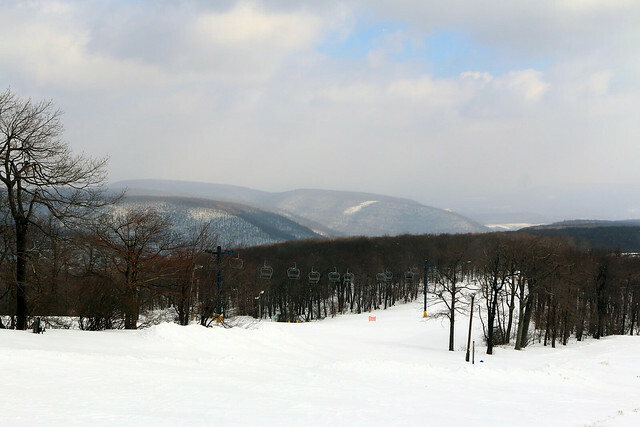 A northeastern view from the second highest point in Pennsylvania can be seen at the Expressway Chairlift on leased park lands operated by the ski resort. A southeastern view can be enjoyed at the Chappells Field Area across from the campground. Included with this view is a close-up of the western slope of Blue Knob Mountain. A southern view can be enjoyed at the Willow Spring Picnic Area. A hike along Mountain View Trail provides a southwestern view along the Appalachian Plateau from the Pavia Overlook. Summer programs are conducted on Friday and Saturday evenings at the Buck Hill Amphitheater and Sunday afternoons in the park day use areas, unless otherwise posted. Organized groups can arrange special programs through the park office. Fall and spring programs are conducted for schools and organizations upon request. This activity or structure is ADA accessible. If you need an accommodation to participate in park activities due to a disability, please contact the park you plan to visit. Call 911 and contact a park employee. Directions to the nearest hospital are posted on bulletin boards and at the park office.